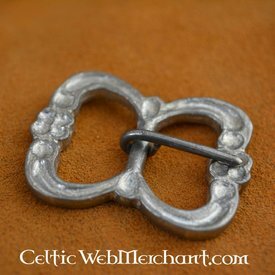 This pewter buckle is a replica of an original from the 15th century found in the medieval city of London. Around this time, London was the centre of international trade and this type of buckle spread worldwide. Pewter is a base metal that is relatively cheap. This made this type of buckle available to all classes of society. The pin was originally made of pewter as well, but this replica features a silvered brass pin, which is a lot sturdier.